Khan al Ahmar is standing and 174 children will start their school year on July 16th as scheduled. Yesterday, Thursday, July 12th, Israel's High Court of Justice responded to the petition filed by the village, providing notice to hold "a hearing, not later than August 15th." The injunction against demolition is extended until their case is heard — but the lawyers for the Government of Israel are moving fast, pressing a hearing date soon because all is ready for demolition. Just as demolition bulldozers were about to roll into Khan al Ahmar, the High Court of Israel issued a last-minute injunction against demolition, requiring the State of Israel to respond to the village's own master plan by July 11th. This gives us more time. Since the US Consulate in Jerusalem is in transition, the strongest way to signal American concern right now is to ask your Members of Congress to visit the village of Khan Al Amar. Rep. Jackie Speier met our delegation last week and said, 'When Congress visited the border, it changed everything. We need to visit Khan al Ahmar.' A key Republican advised us to make it a bi-partisan delegation. Per Ethics Committee rules, they must file forms before Wed July 10th — I turn to YOU. Step 2: Call them on Friday morning at their local office (you'll have to look it up - they are home this week for the July 4th holiday) and their DC office Monday morning, Call Representative Anna G. Eshoo at (202) 225-8104, Senator Kamala D. Harris at (202) 224-3553, and Senator Dianne Feinstein at (202) 224-3841. · I am a Constituent calling with an urgent request. 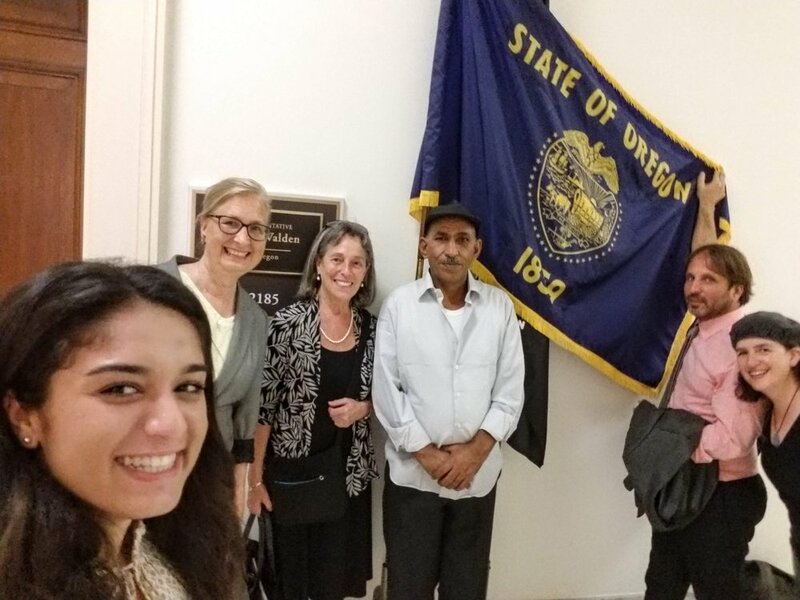 I ask Senator ______ or Congresswoman/Congressman_________ to travel to Jerusalem in August to personally visit the Palestinian Bedouin Village of Al Khan al Ahmar, or give permission for their staff to go. · The trip starts on Thu August 9th. Due to their shortened Senate recess, Senators and Senate staff will have a 4 day trip, returning by Monday morning, and House Members and staff will have a full 7 day trip. Senate returns on Sun Aug 12, House returns on Wed Aug 15. Ok, let's begin. Click here to invite your Senators and Representative. Questions? Suggestions? Tamsin and I are standing by - call us at 650 651-7165. The Tyre School and all Khan Ahmar's homes are standing, however the Israeli Army attacked the peaceful leadership of Al Khan Al Ahmar on July 4th. At dawn, the Israeli Army brought bulldozers to the edge of the Palestinian Bedouin village of Al Khan al Ahmar; they stated that they were there to pave access roads to facilitate the upcoming forced evacuation. Leaving behind the bulldozers, they temporarily left — after which, and a few kilometers away, the Israeli Army demolished eight Palestinian homes in nearby Abu Nuwar. Upon their return, the soldiers stood saying nothing, while villagers and visitors tried to engage them with questions. Caught on this video, the soldiers suddenly attacked them without provocation — and three villagers were hospitalized, while 10 were handcuffed and arrested. Concurrently, the Israeli Army entered Susiya last night at 11pm to photograph the seven homes slated for imminent demolition — taking pictures is a prerequisite to imminent demolition... And today in Al Khan Al Ahmar, the Israeli Army returned, arrested 3 more people, and continues preparing three roads leading into the village for demolition access. P.P.S. If you or someone you know would like to accompany your Congressional office on this trip, please complete this application form and provide your resume and three references in reply to this email. Eid Mubarak! Thank you for your donations. See pictures of the children enjoying their new clothes. Ask your Senators and Representatives to meet with Eid and Alon in DC to keep Khan al Ahmar safe. We ask you to help Gaza’s families break their fast during Ramadan. Please donate now. Our NGO partners, the Women’s Program Center in Rafah-Gaza and the Youth Vision Society in Gaza Beach Camp, have identified families in dire need and sought bids to purchase food. They are buying in bulk, providing $50 worth of food to each family to provide nourishing Iftar dinners during Ramadan. Attah Qasem is a 29-year-old Palestinian who lives with his wife and 2-year-old son in a small room in his father’s house in the al-Shati Refugee Camp west of Gaza City. A second child is on the way, which is both happy news and a source of anxiety. A brief update on yesterday’s Israeli High Court hearing on the Khan Al Ahmar Ab al Helu case as provided by OHCHR. Broken down by subject, this is the latest news across the globe on the Khan Al Ahmar crisis. A request by 15 settlers from Kfar Adumim demanding a “peaceful solution“ to take the rights and voice of the Bedouin into consideration. When you live mired in poverty, every detail of daily life is a challenge. Abeer and Salah al-Akharsah, along with their seven children (and an eighth on the way), live in a remote area of the Gaza Strip—Eraiba, northwest of Rafah. Salah, 41, used to earn a decent income as a trader of goods transported through the tunnels connecting Gaza with Egypt. I was not prepared for what I found when I visited the al-Malalha family in Rafah, in the far south of the Gaza Strip. Their street was lightless, but the dim glow of the moon helped me see so I could walk without tripping. It was lined with farmland and greenhouses. Nothing could be heard but the sound of crickets.